This post is part of a series in which ladies on the road offer a review of their backpacks. Today’s review comes from Cailee. My backpack is the Deuter ACT Lite 45+10 SL. After hours of research to find the perfect bag for my budget, I was able to find this pack for $170. It was hard for me to find everything I wanted in a bag for the perfect cost especially when color was a big deciding factor for me (typical girl). But this women’s fit bag has everything I need for less than $200! >> Check out the Deuter ACT Lite 45+10 L backpack on Amazon. I have never used a backpack bigger than 30 liters to travel with before, I typically use rolling luggage, so my month long trip to Peru was the first time I used the pack. With a variety of companies, sizes, styles and colors to choose from, I realized in the beginning of backpack buying that I had to make a list of what the pack needed to have vs. what I would like it to have. >> Check out the HPL guide to picking a backpack. I needed the bag to be made for a woman; the bags are made for a smaller back, have better hip adjusters and fit better across the chest. The bag also had to have a “sleeping bag” lower compartment separate from the main compartment where I could easily access things without having to pull everything out. Size was also a main concern for me. I didn’t want the pack too big since I would be wearing it most of my trip, but it needed to have enough space for me to pack all I needed with room to buy along the way. I love that the pack is big enough to get all my things in it, but not too big that I over pack. The only negative is that there’s no rain cover, but that is something that can always be bought for $30+ depending on pack size (definitely not a concern). The pack is lightweight at 3 lbs empty and not too heavy when full to capacity. I was traveling Peru in the summer when using this backpack for the first time so my bag was packed with lightweight items. The pack has adjusters at the top so you can pull the bag closer to your body at the height of it which makes it feel more secure. The weight is evenly distributed nicely and fits a smaller back because its built for a women’s shape. This made it feel more part of me than looking like I’ll topple over with one quick breeze. Unfortunately most airlines do not accept carry-on luggage to exceed 24 inches in length and this bag rings in at 29 inches. 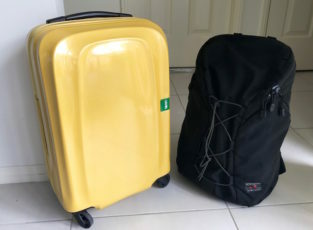 This was a huge concern for me (that my bag couldn’t ride carry-on) when I first started looking, but after researching all shapes, sizes, and weights of bags, I realized for the amount of liters I wanted, the bag just wouldn’t quite fit the regulations. Absolutely! Choosing the right bag takes a lot of research but this bag was the perfect women’s shape, color and size for me. It also had just enough secret pockets that I’m eager to explore the world with it some more! >> Read more Deuter backpack reviews. About the Author: Cailee wants to taste the breeze of every great city. After graduating college in 2011 she has taken on the world by living on the Atlantic Ocean in Martha’s Vineyard, the mountains of Vail, Colorado and the urban life of New York. With a great urge to travel, Cailee finds herself whisked away by any and all adventures and continues her passion to explore by managing her boyfriends band, Feed the Habit. >>See more female backpack reviews on Her Packing List. Thanks for this and all your other most helpful reviews/articles. I spent a good while deliberating between this and its smaller sibling, the 35+10 litre,(with an osprey kyte 46 thrown into the mix too), for a trip involving multi-day trekking and camping in the alps, as well as some day/half day hikes, and also requiring something nice to wear for a party and dancing, as well as some city sightseeing. I was drawn to the 35 litre as it’s nicely compact and seemed to fit everything – but wasn’t entirely convinced it would be up to the job – but it performed wonderfully and is incredibly versatile – seemingly with an almost infinite capacity to expand and compress as required! Another option to consider, if you’re keen on packing light! BTW: In February 2018, the ACT Lite was renamed as Aircontact Lite. Also, it now has a removable lid which can be used as a small, improvised backpack or purse and helps to reduce the length of the backpack. According to Deuter’s Q&A, the hard back plate measures 56cm (45+10 SL) resp. 54cm (35+10 SL) in length, so if if the airline allows 55/56cm and if you are willing to sacrifice a lot of potential volume, you can take it as carry-on luggage. I did with the ACT Lite 35+10 SL and packed approx. 25-30l. I bought the packpack a decade ago and ended up using it on almost every trip. So far, it doesn’t show any wear and tear and I wouldn’t be surprised if it lasted for another ten years. That said, I mostly travel by train and bus with long walks, but don’t do serious trekking. For me, the most important factor is to have a suspension system that makes it easy to carry my luggage for several hours. This one does because it really fits my anatomy (long torso, narrow shoulders, curvy bust and hips).